Head over to Rust-eze’s Racing Center with Disney•Pixar’s Cruz Ramirez and get in shape for the big race! Cruz wants to be the best and the Race Simulator will help her. Turn the screen so she can see the readout, spin the blades of the turbine and start the practice race as she rotates on the platform! Keep it up until she masters the track! Price is 6% below the initial Lego retail price, a € 0.56 discount! This comes down to 15.17 cent per brick. 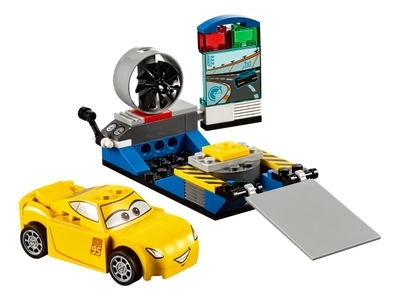 The Cruz Ramirez Race Simulator (10731) Lego set is available from the sites below. However, they do not offer delivery to your selected region. The Cruz Ramirez Race Simulator (10731) Lego set is no longer directly available from the sites below. However, 3rd party partners of these sites might still have the set available. Alternate description Help Disney•Pixar’s Cruz Ramirez become the fastest race car around!